American Quicksilver offers a wide array of spare parts for all of our pneumatic holders. All AQS score knife holder parts are 100% interchangeable with units currently on the market. 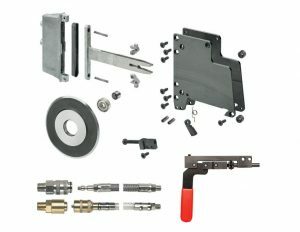 The holder spacers and holder side plates are hardened and precision ground. For both of our score holder styles, there is the option to install the Quickclamp. This quick release lever serves as a speedy clamp and release option for easy access and maintenance of score holders already on the dovetail bar. You have the option of having these installed in-house or for purchase separately. For more information regarding our holder parts, give us a call or contact us today!